What is this? This is a piece of a pair of earrings that was “put” by somebody onto the leaf so that people can see it. When I first saw the earring, I was stunned. 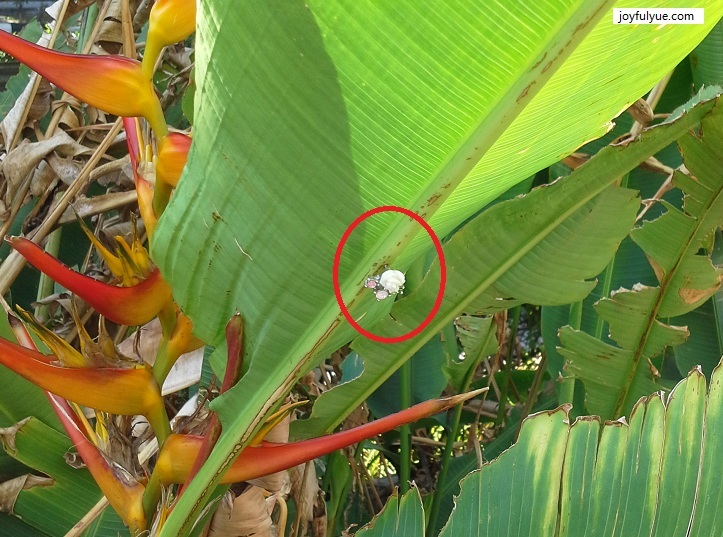 However, it is easily understood that it is a lost earring found nearby the plants. It may not be noticed easily, nonetheless it is comparatively easier to be noticed if the earring was on the ground. You may argue that it is no point putting the earring onto the leaf. It is so small and the person who lost it may just go and buy a new pair of earrings. Yes, you are right. Still, you do not know if the earring has some sentimental value in it. found a student Ez-link card and gave it to the police station. One of my friends has found a wallet in a bus and gave it to the police station. One of my students has found a magnifying glass at school and gave it to the lost and found section of the school. No, this post is not about how honest Singaporeans are. I just want to let you know that if you have lost something, go back to where you have been and look around, you may find it still sitting there, waiting for you to take it home. You may need to look around for a convenient place where people can put the thing on. The first thing that people who have found a lost item is to quickly “get rid” of it, so they most probably would creatively and conveniently put on “something” (a pole, a table, a leaf, etc.) nearby the place. You can try to ask at the front desk and customer service counter too. You may also want to put up a notice to look for your lost item. I have seen a notice at a bus stop, saying that she has lost her phone. The notice was there for a few months, I think the owner never gets her phone back. I have forgotten my umbrella at one of the eating places at Punggol. I went back to the eating place hours later, when the staffs were cleaning and preparing to call it a day. I asked for my umbrella, a staff showed me my umbrella hanging at the cupboard. Beware, though, if you have lost the latest version of a smart phone, most probably you won’t get it back. By Wendy in Life and Science on 05/05/2014 . Those are great stories about lost and found! When I was in China, my wallet fell out of my pocket on the way to the bus. A helpful lady in her twenties was trying to tell me, as soon as I figured out what she was talking about, I looked back and saw my red wallet sitting on the ground. In that moment, and old lady picked up the wallet and started to run away. Before I could react, the helpful lady ran full tilt in her high heels after the old lady, told her off, and gave me back my wallet. Well, my friend, a girl from Shanghai, had bad experience at China. Her bag was cut off and her wallet stolen, more than once. She is disappointed because she is a local and yet, her bag was targeted. Yeah, I never kept anything in my purse/wallet that I would be devastated if it got stolen. All of my purses had zippers, and I carried them diagonally across my shoulders. This meant that I wore a money belt every day for three years. I figured that if someone stole my money belt that I had bigger problems.